On Tuesday, Aug. 23, the School District of Brodhead hosted an orientation for new teachers. During this program, the new teachers met with the superintendent and comptroller to look at different aspects of the employee handbook, complete district forms, and learn about different procedures and policies. 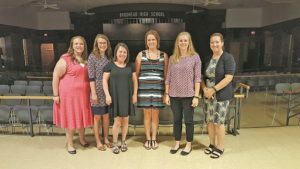 The new teachers also met with the technology director to get set up in the district’s system and learn about all of the different programs that are used within the district. The curriculum director met with the new teachers to review the district software program and each of their class curriculums.